NVS Non-Teaching Staff Syllabus PDF: Hi Viewers are you looking Navodaya Vidyalaya Samiti Syllabus 2018 PDF Download Here. Recently Navodaya Vidyalaya Samiti (NVS) has released the notification for 683 Non-Teaching Staff (Female Staff Nurse, Lower Division Clerk (LDC)/ Lab Attendant, Storekeeper& Catering Assistant) post. The NVS organization will select the candidate for the Non-Teaching post on the basis of Online Computer Based Test (CBT) & Skill Test. Those Aspirants who are qualifying in the CBT Test will be called for Skill Test. Below enclosed the PDF File Links free Download. In National Wide Large number of Applications is applied for this NVS Non-Technical Post. This type tough competition to get the Job in the Navodaya Vidyala Samit Recruitment Notification 2017-2018. 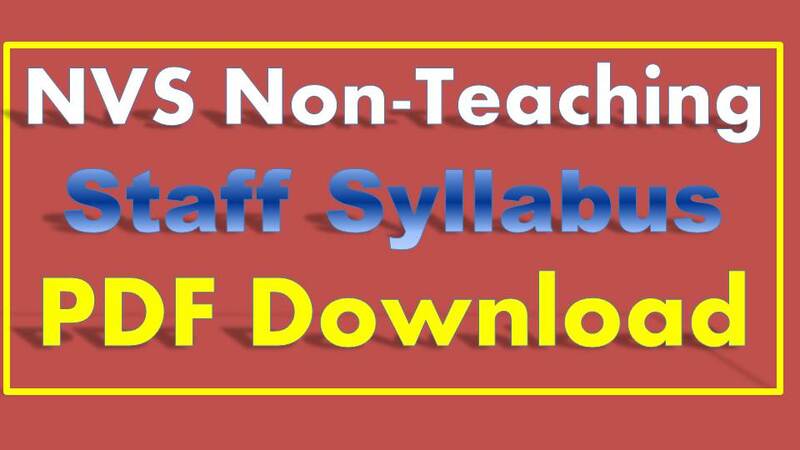 Given below Download the Non-Teaching Staff Syllabus Available PDF Download. Online Computer Based Test will be conducted on 12th, 13th & 14th January 2018. All applied candidate who want to start preparation for LDC, Stenographer and Staff Nurse Examination they must know the detailed syllabus and Examination Pattern of the Computer Based Written Exam. Simple & Compound Interest, etc. The NVS Organization is going to be held the Computer Based Test for recruitment of Non-Teaching Staff (Female Staff Nurse, LDC/ Storekeeper, Lab Attendant & Catering Assistant) post. Computer Based test held on the month January 12th, 13th & 14th 2018. Those candidates who are willing to take part in Lower Division Clerk, Stenographer & Lab Assistant Examination can download NVS Syllabus from here.